One of the best Maps Apps for Android devices around, the Google Maps had only one problem. You had to be connected everytime you wanted to view a map, search a place or plan a ride. Not any more, Google has now updated its Google Maps to include a offline button. Google Plus post announced the update with a new interface and stunning features but none best then the offline maps. 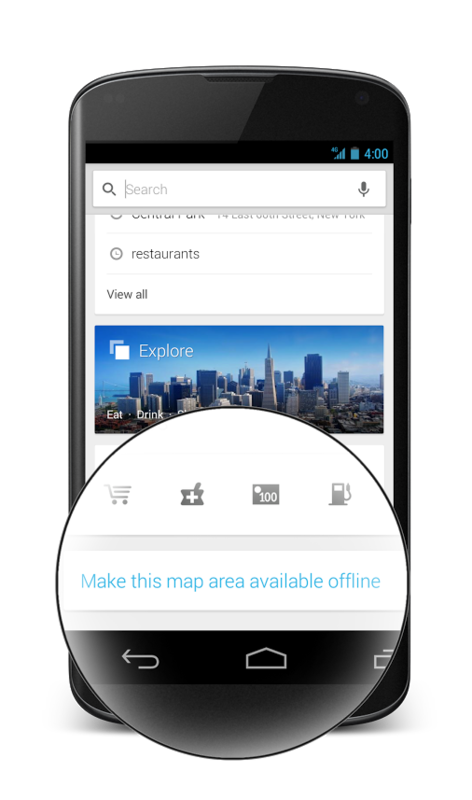 The Google + post by the maps team of Google said that the updated version of the Maps app now has a “Make this map area available offline” card below the search box for easier access for times you need to whip the map out fast. The team has noted in the Google + post that this can work even as you type “OK Maps”. The team has also added a specialized “Where’s Latitude” link at the bottom of the side menu which will provide you with more information about the “future of location sharing”. The updated Maps App will work on Android version 4.0.3 and up and may reach your Android device within a week or so. *Google Latitude is no longer part of the Google Maps app, and we're retiring Latitude on August 9, 2013 http://goo.gl/DIxJM. However, we invite you to try Google’s new location features (http://goo.gl/Mdk4o), which includes seeing friends on a map with Google+ for Android.